It's been a long week and since I'm taking tomorrow off, my freedom begins in a few hours! This break couldn't have come at a better time because I've been struggling with motivation lately, that horrible stuck in a rut feeling that results in asking all sorts of questions. You know the kind - Do I really like my career? what drives me? where to live? - I'm all over the place. These questions are good. I guess. I just thought that once you pass 30 you automatically have a better understanding of your life and the direction you are headed - for me this couldn't be further from the truth. I consider myself so lucky to have found love and be surrounded by wonderful friends and family but in other areas of my life I'm just beginning to understand what inspires me. I've been taking an online course with the lovely Holly from Decor8 and finally am beginning to feel inspired to step out of my comfort zone. Now, I understand I'm not embarking on some life saving peace corp mission but it's given me an outlet to try new things and get to meet some pretty nifty ladies along the way. So before my weekend officially begins, I'm sitting on the couch, cutting out clippings of magazines for this week's homework assignment - always the nerdy student. how fun to do the decor8 course...enjoy the homework - it looks fun. As one myself I think nerds rock! I have a whole stash of magazines that i plan to clip and add to my scrap books (oh yeah, i'm that geeky!) I'm 26 and am having that what shall i do career wise, what do i want to achieve thing at the moment and i was kinda hoping that would all become clear as I got older - and now you're telling me it doesn't? Darn it. 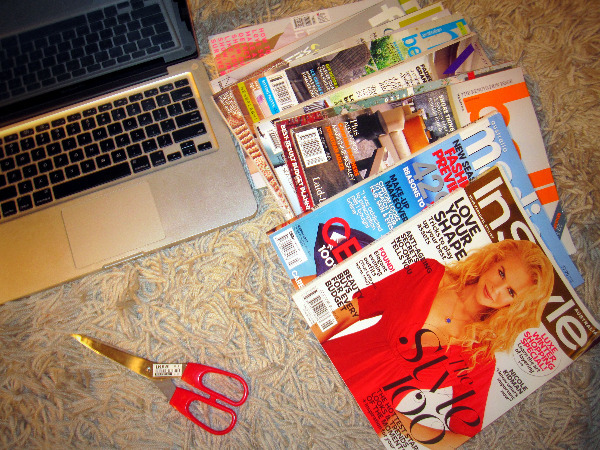 Ooh, a night with magazines and scissors! That's always so fun and inspiring. I haven't even started my yet. Bravo to you. congrats on that feeling of being inspired and wanting to do something new in your life... it's pretty rewarding, isn't it? I think something must have been in the air this week, I had those questions plaguing me too. I'm loving any new outlet though. i want to be the nerdy student. i off the check out this e-course. I'm 44 and taking the class for the same reasons. I seem to hit one of these spots every 5-10 years and even jumped out of a plane recently to unstick myself. It didn't work but it was a lot of fun! I just got out my scissors today and am expecting just as much fun but with better results. Your blog is really interesting to read.